Users need to be invited to Connect in order to access the user based Wi-Fi service. Once they have been added to Connect, you can allocate them a Wi-Fi service after which they will receive an email containing their credentials. All users will need to be invited to Connect before being giving access to Wi-Fi Secure. Click here to find out more about inviting users to Connect. Navigate to the Wi-Fi manager page. Select the users you wish to give Wi-Fi access to and click save. The users will be sent an email from connect@occupie.com with their username and password. If users are using a Windows Operating System that is older than Windows 10, they will need to download a config file. More information for members, including a guide to logging into Wi-Fi Secure and downloading the Windows config file is available in our Member Knowledge Base. 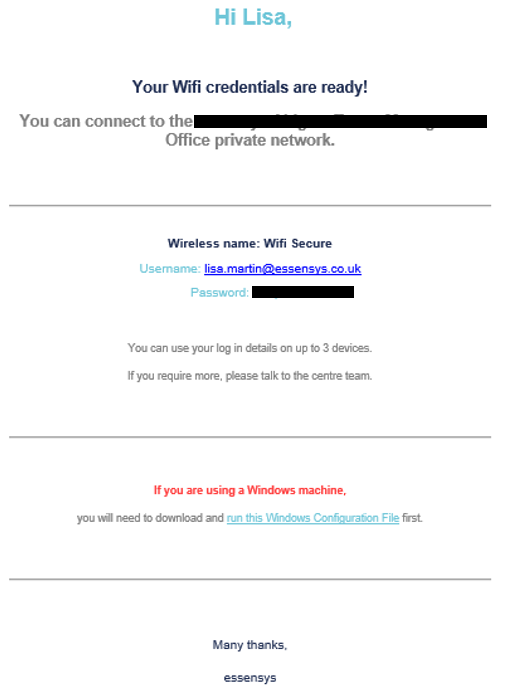 To reset the password for a Wifi Secure users select the client in the Clients page and clicking Wi-Fi Manager. Select the user you would like to reset the password for and then click Reset Wi-Fi Password. The user will receive a new email with the new credentials. You can edit the number of concurrent devices a user is able to log into with their details by selecting the client in the Clients page and clicking Wi-Fi Manager. Here you will see a list of users, select a user and click View Details. You can choose to alter the amount of concurrent devices the user is allowed to use. This is automatically set to 3 devices. Click Save to update this change.